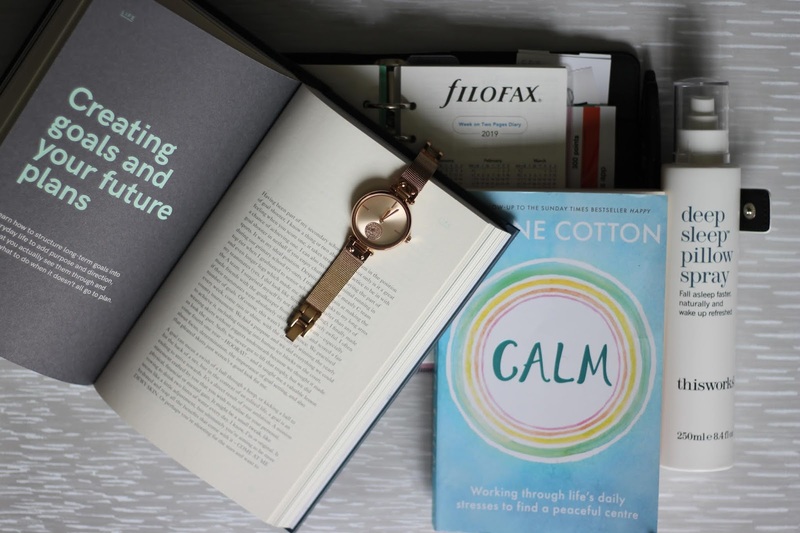 Can you be organised if you're not feeling calm? But then how can you feel calm if you're not organised? This has been going around and around in my head these past few weeks. It's like the age old question, which came first - the chicken or the egg? What comes first, the organisation or the calm? I had all the good intentions of reading the 4 books which were going to transform my life in 2019, convinced that by the end of February I would have finished them because I'm a quick reader and can devour books in no time at all. It took me the whole of January to read my first book which was "Why Mummy Swears". The second book I started was "Calm" by Fearne Cotton, a Christmas gift from my beloved Husband. But I really couldn't get into it. I found it repetitive and it kept alluding to the elusive feeling that I was desperate for...Calm. Maybe I expected too much, maybe I want a book that will just tell me straight up, this is what you have to do in order to feel calm. This book (well as much as I've read of it) doesn't give me that. I had a 5-hour train journey to make to Swansea in February, which was the perfect time for me to focus on my reading and make a dent in the book I'd so far struggled with. But the thought of forcing myself to read it filled me with dread. So I packed myself a "back-up" book because the thought of not being able to read on the train breaks my heart a little - magazines don't always do it for me. I flicked back through the last pages of "Calm" trying to remind myself of what I'd read and I knew then it was pointless, there was another book in my bag that I was already desperate to read - so I made the switch. I love lists; meal plans, shopping lists, to-do lists. I love planning, my Filofax comes everywhere with me and I have a section at the beginning for keeping track of my Christmas Savings and any other payments that I need to make, I've set up an Excel sheet which I can update on my phone to keep track of my daily spending so that I stick to my budget. Some of these things I've been doing for years, other's I've started this year to help me be the better version of myself that I knew I could be. You could argue really that I didn't really need to read "An Edited Life" because most of her suggestions are things I'm already doing. There must be a trick I'm missing, there's something that I'm doing utilising because I still can't relax enough to get feel zen. If I don't fully feel like I've got my s**t 100% together, it's probably what's stopping me from feeling calm and why I struggled to get into the book. I still have that anxious feeling in the pit of my stomach, as if I'm nervous for something that's about to happen. Maybe it's the fact that Martha's next appointment in London is a little over a month away, with the potential of turning our lives upside down again and taking away any control I might feel over our lives. Maybe, as a parent to a child with a complex medical condition, we never really have full control of our lives. Maybe, I can meal plan as much as I want and take my Filofax anywhere I want - but I'll always live in 3-6 month time frames and won't be able to look any further than that into the future. Maybe, that's what I need to feel calm about. Possibly, there's not a book in the world that can teach me how to feel calm about the way our lives are. I'm a little control freak who needs to learn to let go. Because the one thing I really want to control is Martha's health and out of everything in our lives it's the only thing I can't control. But if everything else is boxed off then maybe, just maybe, I'll be OK.